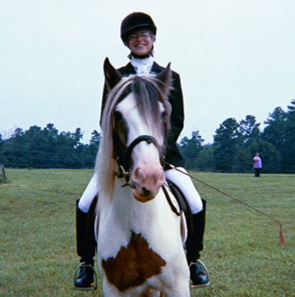 Blarney Stone Acres (BSA) is home to world class Gypsy Horses. 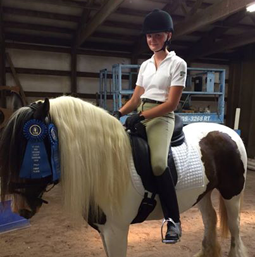 Why are BSA Gypsy Horses world-class? We've made many trips overseas and collected DNA that was contributed to the US data base, and recorded the history of the Romany families who have bred Gypsy Horses for generations. 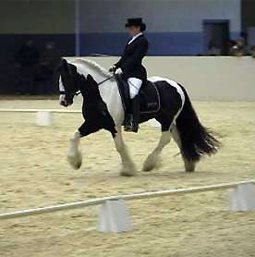 BSA horses are consistently winning in the all-breed show ring excelling in dressage, jumping, driving, Western and English pleasure classes. 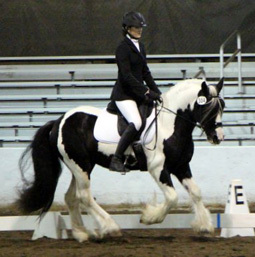 Showing under all breed judges, BSA horses are "always in the ribbons" competing against winning quarter horses, saddlebreds, Arabians, thoroughbreds, and many other Gypsy Horses. We have done extensive research on the nutritional needs of the Gypsy Horse and implemented an outstanding feeding program. Read more about Our Clients' awards and achievements! Blarney Stone Acres is located on 25 beautiful acres in the wine country of Missouri. Proud to be members of our new community, we continue to enjoy our Gypsy Cobs and new friends by taking part in community events, parades, horse shows and just good ole fun trail rides. 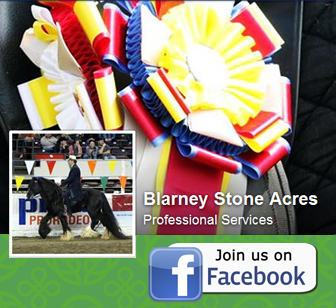 Blarney Sone Acres was established years before our journey into the Gypsy cob breed began in 2000. At that time there was very little research and information available regarding the breed. From the beginning, we have taken a hands on approach in doing extensive breed research and data collection in the US and abroad. We worked with over 25 foundation gypsy families in gathering history, pictoral, written, dna and verbal documentation regarding the heritage of this horse. Our farm is located on 25 beautiful acres in the wine country of Missouri. Blarney Stone Acres is a private facility, open for visits by interested buyers by appointment only. Gypsy horses sold at Blarney Stone Acres are bred from horses purchased from private Romany families in England who have been breeding these horses for generations.